Kathryn McKinley, Professor of English, has been a recipient of grants and awards from the National Endowment for the Humanities, the American Philosophical Society, and the Harry Ransom Humanities Research Center. She is also the founder of the interdepartmental minor in Medieval and Early Modern Studies (MEMS) at UMBC, which is one of the few of its kind in the Baltimore/Washington region. 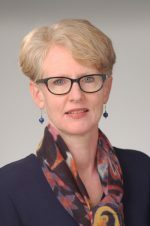 Her research and teaching interests include Chaucer; Ovid, Boccaccio, and late medieval vernacularity; medieval visual literacy and material culture; and the history of later medieval European and English food culture, food scarcity, and famine. She has published in such journals as The Chaucer Review, Viator, and English Manuscript Studies 1100-1700. Her publications include Reading the Ovidian Heroine: Metamorphoses Commentaries 1100-1618 (Leiden, 2001), an article on Chaucer’s House of Fame in Meaning in Motion: The Semantics of Movement in Medieval Art (Princeton, 2011); Ovid in the Middle Ages (Cambridge, 2011; coedited with Frank T. Coulson and James G. Clark); and Chaucer’s House of Fame and Its Boccaccian Intertexts: Image, Vision, and the Vernacular (Toronto: Pontifical Institute of Mediaeval Studies, 2016). This study considers how Chaucer’s House of Fame engages Boccaccio’s writings as much as Dante’s. McKinley thus addresses in new ways this broader triangular relationship between Dante, Boccaccio, and Chaucer. Boccaccio’s Amorosa visione gave Chaucer a viable model for a response to Dante’s theocentric poetics. This volume presents a groundbreaking series of essays on Ovid’s reception across the Middle Ages. The collection includes contributions from distinguished Ovidians as well as leading specialists in medieval Latin and vernacular literature, clerical and extra-clerical culture and medieval art, and addresses questions of manuscript and textual transmission, translation, adaptation and imitation. This study investigates the reception of Ovid’s heroines in “Metamorphoses” commentaries written between 1100 and 1618. The Ovidian heroine offers a telling window onto medieval and early modern clerical constructions of gender and selfhood.